Book One: Discovery. Since time immemorial, the forces of New Genesis and Apokolips have stood at odds for control over the universe. Nothing less than the threat of total cosmic destruction could forge an alliance between Highfather and Darkseid...but that time has come and the story is told in the COSMIC ODYSSEY. Metron has at last unlocked the secret of the mysterious Anti-Life Equation, the very meaning of life itself...throwing the fate of the entire universe into question. The only chance for salvation is a hastily assembled team of the universes greatest heroes, consisting of Superman, Batman, Green Lantern, Martian Manhunter, Starfire, Orion and others...operating under the joint supervision of Highfather and Darkseid. Book One: Discovery. 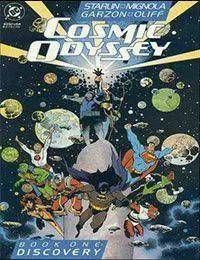 Since time immemorial, the forces of New Genesis and Apokolips have stood at odds for control over the universe. Nothing less than the threat of total cosmic destruction could forge an alliance between Highfather and Darkseid...but that time has come and the story is told in the COSMIC ODYSSEY. Metron has at last unlocked the secret of the mysterious Anti-Life Equation, the very meaning of life itself...throwing the fate of the entire universe into question. The only chance for salvation is a hastily assembled team of the universes greatest heroes, consisting of Superman, Batman, Green Lantern, Martian Manhunter, Starfire, Orion and others...operating under the joint supervision of Highfather and Darkseid.